Trust and reputation are key when you hire a foundation, crawl space, concrete lifting, or basement waterproofing contractor. At JES, this is how we do business. Let us prove it to you. Learn how you can save yourself time and money by requesting a free crawl space inspection and receive your FREE full-color “Homeowner’s Guide to Foundation Repair”, written by the Professional Engineers at JES. If you’re sick and tired of your nasty, smelly, crawl space, then you need proven, patented, affordable, long-term solutions from experts in crawl space moisture management and encapsulation, and a thorough inspection to identify the source of your crawl space problems. 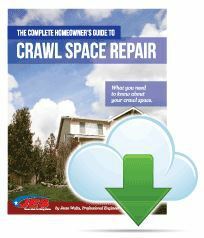 When you request your free inspection today, you will receive our full-color “Homeowner’s Guide to Crawl Space Repair”, written by the Professional Engineers here at JES! It includes everything you need to know about your home’s foundation, including what causes foundation problems, what problem signs to look for, and what to look for in a foundation repair contractor. Get your free guide today! Rather talk to a live person? Give us a call at (888) 377-1893! © 2017 JES Construction, LLC All Rights Reserved.